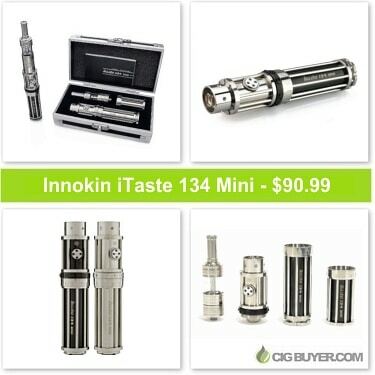 The best deal on the Innokin iTaste 134 Mini available! The iTaste 134 Mini is the “baby brother” of the iTaste 134 – which is a behemoth of an APV that’s designed to resemble a Gatling gun. These regulated, microprocessor controlled VW personal vaporizers look virtually identical and they both let you easily adjust the wattage with their rotational wheels. Providing the same great performance and ultra-cool appearance, the big advantage of the Mini is it’s drastically reduced size.